Please refer to list below for Compatibility. Exceptional Products For Exceptional Yards. Great yards demand equipment that’s as dedicated and hardworking as you. Fortunately, the Husqvarna range of lawn and garden equipment offers everything from lawnmowers and ride-on mowers to trimmers and chainsaws to let you master your great outdoors. You and Husqvarna – together we will make your yard the envy of the neighborhood. 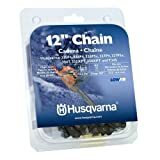 Husqvarna Forest and Garden offers a 20-inch long, .325-inch wide chainsaw replacement chain with 80 drive links. It fits models 346XP, 350, 351, 353, 450, 545, 550XP & 450 Rancher.